What many of us were suspecting has now been confirmed, as The Year of the Shape continues with a 40th anniversary re-release of John Carpenter’s original Halloween coming this September for the first time in a new 4K UHD (Ultra High Definition) Blu-ray transfer. UPDATE: An official announcement was made on July 30 confirming this release, along with the cover art reveal, which you can see below, and a revised release date. With this year marking the 40th anniversary of the initial theatrical release of Carpenter’s Halloween, we totally anticipated a new re-release, and with 4K being the current rage, it only makes sense that this landmark film would get the latest upgrade. This 2018 release will include a standard Blu-ray as well as a new 4K Ultra HD disc of Halloween. John Carpenter’s Halloween 40th anniversary 4K UHD Blu-ray will be released on Tuesday, September 25, 2018. 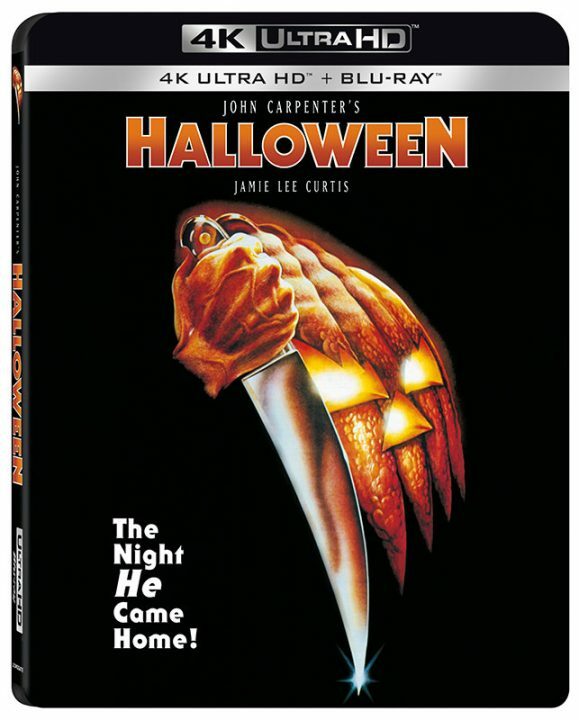 The cover art features the classic theatrical poster of the jack-o-lantern and knife, which the disc art re-uses the Michael Myers art by Jay Shaw from the Halloween 35th anniversary Blu-ray release.